In just over a decade, PHIT Comedy has grown from a small Training Center, to a major national Stage for Comedy, and is now boldly transforming to include an Internet Presence for Philly Comedy. Read on to learn more of our history! PHIT Comedy originally started in November 2005 as a training center for improv comedy. Our first classes and workshops were offered in January 2006. Since that time, we have continuously offered small classes with the top improv teachers in the city while growing over the course of more than a decade to encompass training in improv comedy, sketch comedy, stand-up comedy, musical comedy, and comedy acting. PHIT’s Training Center now rivals major theater institutions in Philadelphia like the Walnut Street Theatre School in the size and scope of it’s offerings, with 5 sessions of classes offering each year, more than 100 courses offering annually, and 350-400 students enrolled at any given point during the year. Alumni of our Training Center have gone on work in comedy and the entertainment industry in major cities like New York, Chicago, and Los Angeles and overseas in the United Kingdom. Over the years we have developed an extensive set of contacts, allowing us to host master classes with people like Matt Besser (Upright Citizens Brigade), Scott Adsit (30 Rock), Kevin McDonald (Kids in the Hall), Kevin Allison (The State, RISK! ), Ali Faranakian (SNL), Christine Nangle (SNL, The Kroll Show), Rich Talarico (SNL, Key & Peel, The Tonight Show), Christina Gausas (Girls, Difficult People), Luke Giordano (Two and a Half Men), Keith Johnstone (author of Impro) and countless others. In 2014, PHIT Comedy expanded the reach of our education program by creating the PHIT Kids & Teens program, offering classes in improvisation for children in grades K-12 in fall and spring sessions. Since it’s founding, PHIT has taken the lessons of improv into workplaces through it’s PHIT Corporate program. We’ve worked with everyone from small start-ups to the entire Guinness national sales team. Our clients have ranged from small businesses to important regional brands like Wawa to Fortune 500 companies like Bank of America, Comcast, and General Electric. In 2016, the theater hired our first sales director for our Corporate Workshops and Touring Company programs. Throughout our first year, PHIT Comedy had occasional improv nights at Fergie’s Pub (1214 Sansom Street) in their second floor private bar. At the start of 2007 the theater began producing one week of programming each month at the now closed Shubin Theatre. PHIT Comedy hosted notable performers such as Keith Johnstone (author of Impro and one of the leading improv teachers in the world), musical improv performances by I Eat Pandas, BASSPROV, harold teams from the Upright Citizens Brigade Theatre in New York, and many other out-of-town performers representing the best improv comedy around the country. In 2008 the theater created PHIT-trained and supported ensembles, and became a major presence in the Philly Fringe Festival (by programming three weeks of non-stop improv and sketch comedy on the Adrienne Theatre’s Mainstage). The 2008 Fringe also featured a production of Philly’s first improv-to-script stage musical: The Hoppers Hit the Road. In 2009, we branched into regular showcases of sketch comedy and stand-up comedy to include more members of the budding comedy community in Philly and expanded our performance calendar as well – hosting two weeks of shows each month. By 2010 PHIT was rapidly outgrowing the Shubin Theatre and began the lengthy process of searching for a permanent home that could bring all our programs under one roof with a Kickstarter campaign to fund our search for space, the legal paperwork which would be required, and the costs of relocation. After raising more $15,000 dollars on an original $10,000 goal (the largest amount ever raised by a Philadelphia Kickstarter at that time) we set to work locating what we envisioned as “a home for alternative comedy” in the city. During our search for a new home from 2011-2013 the theater continued to be a major presence in the comedy scene for Philadelphia – with our shows at The Shubin and massive contribution to the Philly Fringe Festival (over 50 Fringe shows from 2006-2013). January 2014 saw the opening of PHIT’s permanent home for comedy on the Second Stage of the Adrienne Theatre in the heart of Philly’s Center City neighborhood of Rittenhouse Square. From it’s new home PHIT Comedy began offering comedy shows 52 weeks a year and welcomed an audience of over 30,000 fans of comedy in it’s first year of full-time producing. 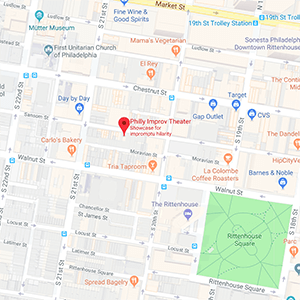 In addition to providing a hub for the enormous comedy community PHIT had helped to created in the city, it also put us in the immediate vicinity of two other amazing comedy institutions: Helium Comedy Club (across the street) and ComedySportz Philadelphia (also resident inside the Adrienne Theatre). In 2015-2016, PHIT Comedy expanded again – taking over additional space for an expanded Training Center inside The Adrienne Theatre in the summer of 2015, and opening an additional performance venue on the Adrienne Theatre Mainstage in the summer of 2016. When this expansion is completed, PHIT will offer in excess of 1,000 comedy performances to the city of Philadelphia annually – and with an average ticket price of just $10 will make it easy for the masses to enjoy a laugh any (or every!) day of the year. In 2016, PHIT Comedy began our move onto the internet by creating the Rocket Comedy Network – which hosts podcasts and digital sketch teams featuring our talented performers through multiple social media channels.